Before Easter, I had the opportunity to visit some refugee camps for those who have been displaced by the recent eruptions of Mt. Sinabung in the Karo regency of North Sumatra. After hundreds of years without any activity, Mt. 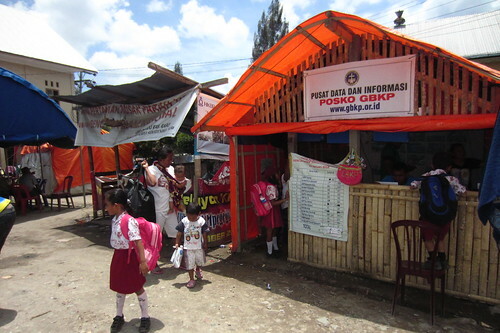 Sinabung erupted again in 2010, causing mass evacuations and refugee camps. 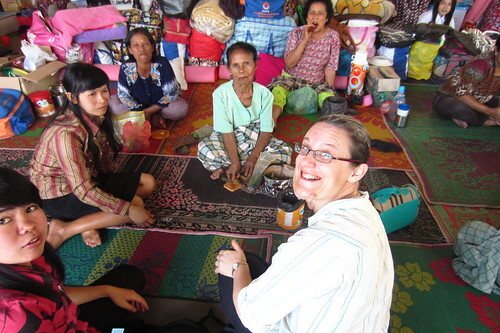 People were allowed back, but have been displaced again since last September when the volcano again erupted. Since September hundreds of eruptions have occurred, a few of them large with ash, lava, and pyroclastic flows. As many as 20,000 were evacuated during the eruptions, and now that number is still more than 5,000–the remaining are from inside 3km from the volcano, and many of their homes are destroyed. Together with 4 of my students, we went to Kabanjahe to learn about the social ministry of the Gereja Batak Karo Protestan (GBKP, or Karo Protestant Church). The GBKP currently supports 12 refugee camps for those not able to return to their land, and they will continue to house and feed them for as long as necessary. Help from the government is scant, although it is hoped that the government will be involved to resettle the people whose homes were destroyed and for whom it is too dangerous to return. 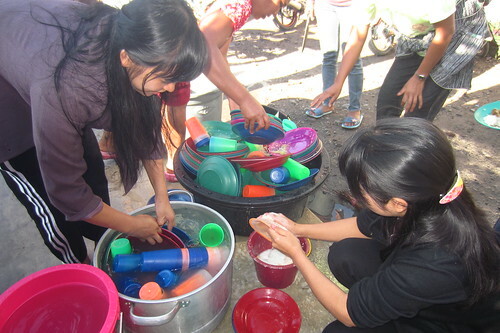 After touring some of the camps, we volunteered to help cook, wash dishes, clean, and talk with the people, even give the children an English lesson. Below are some photos. Chewing betel nut with the grandmothers. In Karo culture, this is common for women. 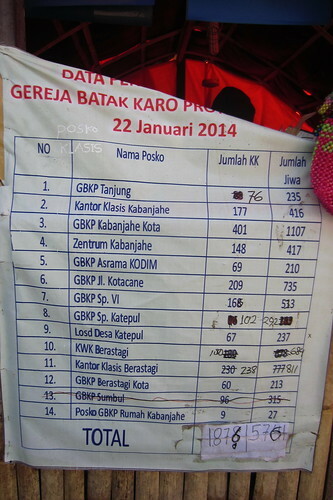 The list of camps from the GBKP; total number of people is 5,761. Here is an article from The Atlantic of some incredible photos of the eruptions from Mt. Kelud (on Java), and Mt.Sinabung (Sumatra).